A pioneer who is perhaps not so well remembered as he should be is Hargrave, who is, of course, famous as the inventor of the box kite, but whose researches in aviation generally are less well known. 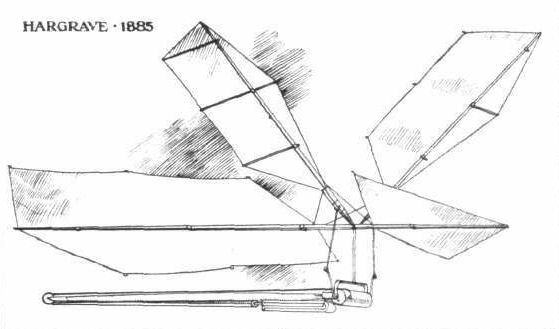 He read a most interesting and instructive series of papers before the Royal Society of New South Wales, and in 1885 he succeeded in demonstrating before that assembly the successful flight of a model that was propelled by flapping wings. Hargrave's wing-propelled model built in Australia in 1885. - The wings were for propulsion only, the weight in flight being supported by the aeroplane surfaces fore and aft. Several successful flights were made. Elastic provided the motive power.